German author; born in the Black Forest village of Nordstetten, Germany, Feb. 28, 1812; died at Cannes, France, Feb. 8, 1882. He was one of eleven children, and received his earliest training from a well-equipped German teacher named Frankfurter and from the local Protestant minister. Intended by his father for the rabbinical profession, Auerbach was early initiated into Jewish studies, and in his twelfth year was sent to the Talmud school at Hechingen, and afterward to Carlsruhe, to complete his rabbinical training. In the latter town, however, he soon gave up his Talmudical studies entirely, and devoted himself to secular branches. He attended the Stuttgart Obergymnasium to prepare for the university, and at Tübingen (1832) studied law. Coming, however, under the influence of David Friedrich Strauss, author of "Das Leben Jesu" (whom he ever held in reverence), he exchanged the study of law for that of history and philosophy, to which subjects he continued to devote himself (1832-35) at Munich under Schelling, and at Heidelberg under Daub and Schlosser. Spinoza now became Auerbach's ideal philosopher and guide, and remained so throughout the whole period of his literary activity. Like others among the studentcorps, Auerbach manifested something of the democratic spirit; and, as the result of a governmental investigation, he was imprisoned for three months at Hohenasperg (1837). The period was one of petty despotism in Germany, and Auerbach suffered the rigors of university discipline to such an extent as to compel him to abandon his university career and to turn to literature for a livelihood. In 1836, in reply to Wolfgang Menzel's attack on the "Junge Deutschland," for all of whose literary and political sins he held the Jews responsible, Auerbach had published his first pamphlet, "Das Judenthum und die Neueste Literatur" (Stuttgart), wherein he pleaded for a fuller recognition of Jewish ideals; but the age was hardly ripe for such progress: the days of '48 had not yet dawned. He also wrote, under the pseudonym of "Theobald Chauber" (an anagram of his name), a biography of Frederick the Great, Stuttgart, 1834-36, and numerous articles for periodicals. His early works were romances illustrating various types of Jewish thought and activity. Thus, in 1838, together with N. Frankfurter, he continued the "Gallerie der Ausgezeichneten Israeliten Aller Jahrhunderte; Ihre Portraits und Biographien" (3d and 4th instalments), begun by Spazier. Along this same line was his other book, "Spinoza, ein Historischer Roman in Zwei Theilen" (Stuttgart, 1837, newest edition, with supplement, "Ein Denkerleben," 1880); half story, half philosophical dissertation, in which his admiration for the Jewish thinker attained the point of glorification. It was followed by "Dichter und Kaufmann" (Stuttgart, 1839; 4th revised ed., 1860; 7th ed., 1871), based on episodes in the life of Moses Ephraim Kuh, a luckless Breslau poet, and wherein he drew a lively picture of the Jews in the time of Moses Mendelssohn. Auerbach's idealism, however, was not to limit itself to heroes of the Ghetto: he was to enter a broader field and do his share in arousing the German people to a sense of national unity long before the battle of Sedan. To familiarize the German of the North with the character and temperament of the German of the South (after having published, in 1841, a German translation of Spinoza's works, with biography, in five volumes, and, in 1842, a popular treatise, "Der Gebildete Bürger, ein Buch für den Denkenden Menschenverstand"), he published his incomparable "Schwarzwälder Dorfgeschichten," Mannheim, 1843, which at once gave their author international fame. It was an epoch-making work in the history of German literature, and was translated into almost all European languages. What is particularly noteworthy therein is the success of Auerbach, a Jew, in describing all the depth of the religious life of the Christian peasant. That an atmosphere of "Spinozism" breathed through these most artless tales did not materially detract from their charm. In his second collection of "Dorfgeschichten" (Mannheim, 1848, 1853), stronger characters and more complex plots were substituted for the idyllic backgroundsof his former literary attempts. In the interval between these two works, Auerbach published a treatise descriptive of his literary methods, "Schrift und Volk, Grundzüge der Volksthümlichen Literatur," and from 1845 to 1848 issued a very popular calendar, called "Gevattersmann." In Breslau, in 1847, he married Augusta Schreiber, who died the following year in childbirth. This bereavement prevented him from taking any very active part in the Revolution of 1848. He nevertheless went to Vienna, where he witnessed the October days, and described his impressions of those stormy scenes in his "Tagebuch aus Wien; von Latour bis Windischgrätz," Breslau, 1849. He married again in Vienna soon after, espousing Nina Landesmann, a sister of the poet Hieronymus Lorm, and in 1849 settled in Dresden, whence, ten years later, he removed to Berlin, which then became his permanent abode. There he came into contact with the foremost writers and artists of the Prussian capital, and was received at court; but spent every summer in his native village in the Black Forest, seeking there recuperation and new inspiration for his literary labors. 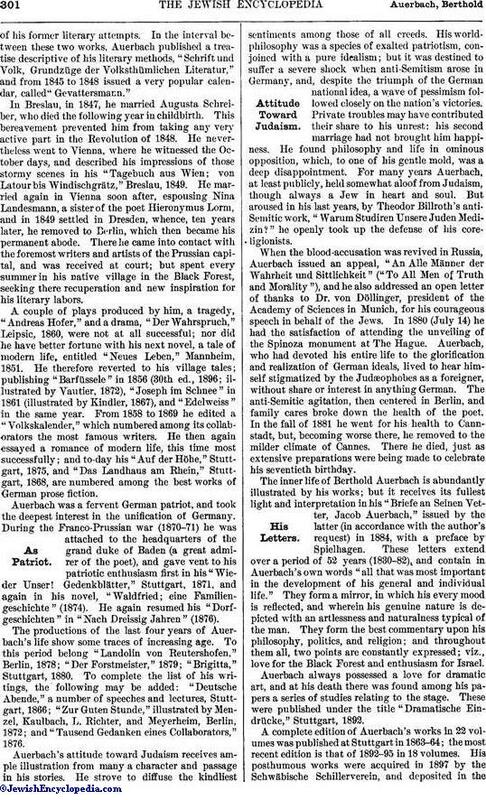 A couple of plays produced by him, a tragedy, "Andreas Hofer," and a drama, "Der Wahrspruch," Leipsic, 1860, were not at all successful; nor did he have better fortune with his next novel, a tale of modern life, entitled "Neues Leben," Mannheim, 1851. He therefore reverted to his village tales; publishing "Barfüssele" in 1856 (30th ed., 1896; illustrated by Vautier, 1872), "Joseph im Schnee" in 1861 (illustrated by Kindler, 1867), and "Edelweiss" in the same year. From 1858 to 1869 he edited a "Volkskalender," which numbered among its collaborators the most famous writers. 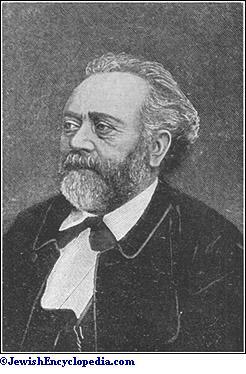 He then again essayed a romance of modern life, this time most successfully; and to-day his "Auf der Höhe," Stuttgart, 1875, and "Das Landhaus am Rhein," Stuttgart, 1868, are numbered among the best works of German prose fiction. Auerbach was a fervent German patriot, and took the deepest interest in the unification of Germany. During the Franco-Prussian war (1870-71) he was attached to the headquarters of the grand duke of Baden (a great admirer of the poet), and gave vent to his patriotic enthusiasm first in his "Wieder Unser! Gedenkblätter," Stuttgart, 1871, and again in his novel, "Waldfried; eine Familiengeschichte" (1874). He again resumed his "Dorfgeschichten" in "Nach Dreissig Jahren" (1876). The productions of the last four years of Auerbach's life show some traces of increasing age. To this period belong "Landolin von Reutershofen," Berlin, 1878; "Der Forstmeister," 1879; "Brigitta," Stuttgart, 1880. To complete the list of his writings, the following may be added: "Deutsche Abende," a number of speeches and lectures, Stuttgart, 1866; "Zur Guten Stunde," illustrated by Menzel, Kaulbach, L. Richter, and Meyerheim, Berlin, 1872; and "Tausend Gedanken eines Collaborators," 1876. Auerbach's attitude toward Judaism receives ample illustration from many a character and passage in his stories. He strove to diffuse the kindliest sentiments among those of all creeds. His world-philosophy was a species of exalted patriotism, conjoined with a pure idealism; but it was destined to suffer a severe shock when anti-Semitism arose in Germany, and, despite the triumph of the German national idea, a wave of pessimism followed closely on the nation's victories. Private troubles may have contributed their share to his unrest: his second marriage had not brought him happiness. He found philosophy and life in ominous opposition, which, to one of his gentle mold, was a deep disappointment. For many years Auerbach, at least publicly, held somewhat aloof from Judaism, though always a Jew in heart and soul. But aroused in his last years, by Theodor Billroth's anti-Semitic work, "Warum Studiren Unsere Juden Medizin?" he openly took up the defense of his coreligionists. When the blood-accusation was revived in Russia, Auerbach issued an appeal, "An Alle Männer der Wahrheit und Sittlichkeit" ("To All Men of Truth and Morality"), and he also addressed an open letter of thanks to Dr. von Döllinger, president of the Academy of Sciences in Munich, for his courageous speech in behalf of the Jews. In 1880 (July 14) he had the satisfaction of attending the unveiling of the Spinoza monument at The Hague. Auerbach, who had devoted his entire life to the glorification and realization of German ideals, lived to hear himself stigmatized by the Judæophobes as a foreigner, without share or interest in anything German. The anti-Semitic agitation, then centered in Berlin, and family cares broke down the health of the poet. In the fall of 1881 he went for his health to Cannstadt, but, becoming worse there, he removed to the milder climate of Cannes. There he died, just as extensive preparations were being made to celebrate his seventieth birthday. 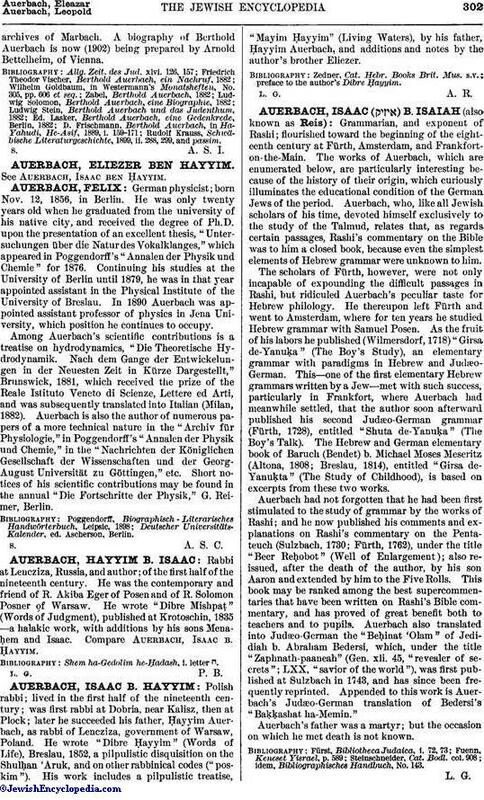 The inner life of Berthold Auerbach is abundantly illustrated by his works; but it receives its fullest light and interpretation in his "Briefe an Seinen Vetter, Jacob Auerbach," issued by the latter (in accordance with the author's request) in 1884, with a preface by Spielhagen. These letters extend over a period of 52 years (1830-82), and contain in Auerbach's own words "all that was most important in the development of his general and individual life." They form a mirror, in which his every mood is reflected, and wherein his genuine nature is depicted with an artlessness and naturalness typical of the man. They form the best commentary upon his philosophy, politics, and religion; and throughout them all, two points are constantly expressed; viz., love for the Black Forest and enthusiasm for Israel. Auerbach always possessed a love for dramatic art, and at his death there was found among his papers a series of studies relating to the stage. These were published under the title "Dramatische Eindrücke," Stuttgart, 1892. A complete edition of Auerbach's works in 22 volumes was published at Stuttgart in 1863-64; the most recent edition is that of 1892-95 in 18 volumes. His posthumous works were acquired in 1897 by the Schwäbische Schillerverein, and deposited in thearchives of Marbach. 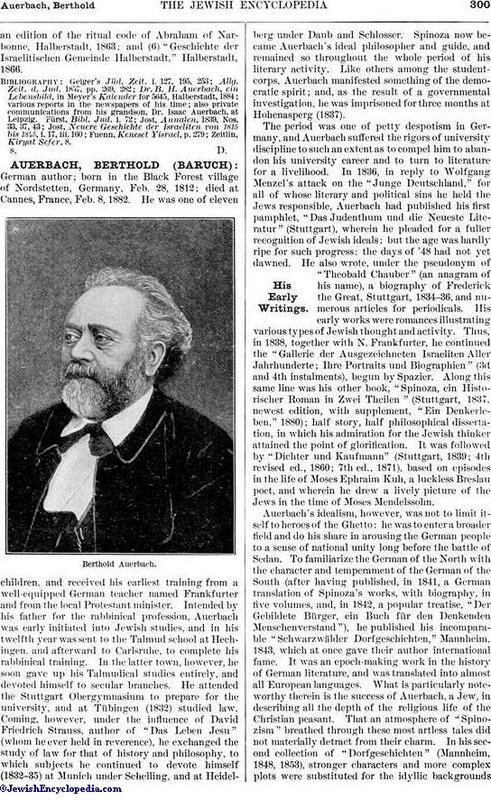 A biography of Berthold Auerbach is now (1902) being prepared by Arnold Bettelheim, of Vienna. Rudolf Krauss, Schwübische Literaturgeschichte, 1899, ii. 288, 299, and passim.